It's been awhile since we had a Three-Day / Fourth of July Weekend ... so we're taking full advantage of it by combining ALL of our weekly features into one gigantic posting so that WE can enjoy some time off, too!!! 7/4/64 - America may be celebrating Independence Day today … but The British still have a pretty good hold on our pop charts! No less than 17 British Hits are on the Hot 100 Pop Singles Chart this week … and two unique arrangements of previous BEATLES Hits (I WANT TO HOLD YOUR HAND by THE BOSTON POPS ORCHESTRA and ALL MY LOVING by THE HOLLYRIDGE STRINGS) also premier this week! Here's your recap: DON'T LET THE SUN CATCH YOU CRYING by GERRY AND THE PACEMAKERS hits a new high at #4, PETER AND GORDON's first hit, A WORLD WITHOUT LOVE, falls from #1 to #6, BAD TO ME by BILLY J. KRAMER AND THE DAKOTAS holds at #9 while CAN'T YOU SEE THAT SHE'S MINE by THE DAVE CLARK FIVE climbs from #16 to #10. BILLY J's flip-side, LITTLE CHILDREN is at #14, followed by DON'T THROW YOUR LOVE AWAY by THE SEARCHERS at #18, THE BEATLES' LOVE ME DO at #19, YESTERDAY'S GONE at #21 for CHAD AND JEREMY, DIANE by THE BACHELORS at #27, THE DAVE CLARK FIVE again at #40 with DO YOU LOVE ME, WISHIN' AND HOPIN', up to #44 for DUSTY SPRINGFIELD, NOBODY I KNOW, a major leap for PETER AND GORDON, climbing from #73 to #48, NOT FADE AWAY by THE STONES at #55, I BELIEVE (new on the charts for THE BACHELORS at #71), YESTERDAY'S GONE by THE OVERLANDERS at #77, YOU'RE MY WORLD premiers at #80 for CILLA BLACK as does the second ROLLING STONES' American Chart Hit, TELL ME at #81. Here in Chicago, The Beach Boys top the chart (for the first of two weeks) with their latest, "I Get Around" ... and then the British take over: "Little Children" by Billy J. Kramer and the Dakotas is at #2, "A World Without Love" by Peter and Gordon at #3 and "Can't You See That She's Mine" by The Dave Clark Five at #4. Gerry and the Pacemakers also have a Top Ten Hit with "Don't Let The Sun Catch You Crying", which came in at #9 this holiday weekend. Filling out The Top 40, we've got The Searchers at #16 with "Don't Throw Your Love Away", Peter and Gordon at #29 with "Nobody I Know" and Dusty Springfield, new on the charts at #40 with "Wishin' And Hopin'". One of this week's featured albums is "A Hard Day's Night" by The Beatles ... they'd premier the following week with the title track as one half of a two-sided hit, featuring "I Should Have Known Better" on the B-Side. 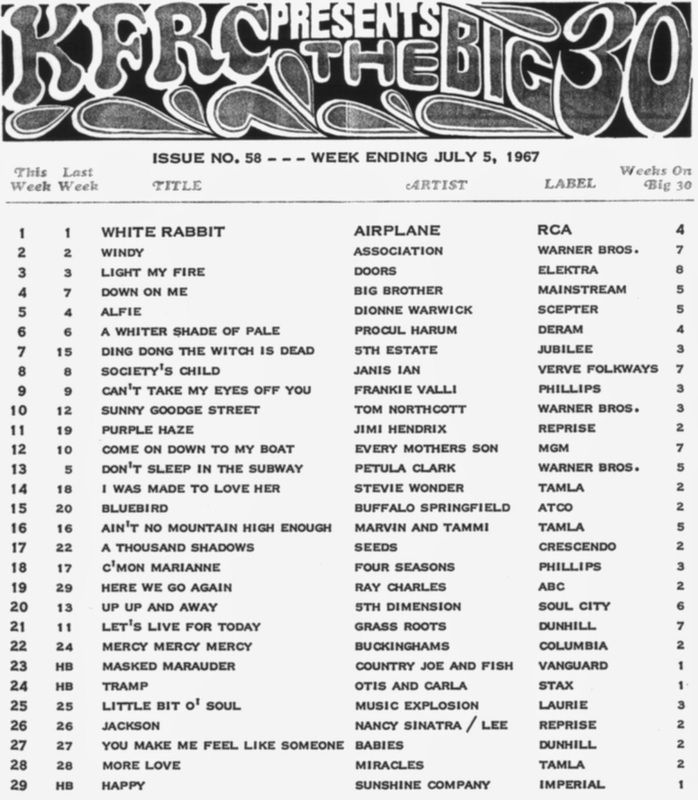 The Jefferson Airplane top the list on this KFRC from 1967 ... other "Heavy Hits" include "Light My Fire" by The Doors, "Down On Me" by Big Brother and the Holding Company, "A Whiter Shade Of Pale" by Procol Harum, "Society's Child" by Janis Ian, "Purple Haze" by Jimi Hendrix, "Bluebird" by The Buffalo Springfield, "A Thousand Shadows" by The Seeds and "Masked Marauder" by Country Joe and the Fish. But there are plenty of POP hits here, too ... "Windy" by The Association is at #2, "Alfie" by Dionne Warwick at #5 ... as well as hits for both Frankie Valli as a solo artist ("Can't Take My Eyes Off You", #9) and with The Four Seasons ("C'mon Marianne", #18). 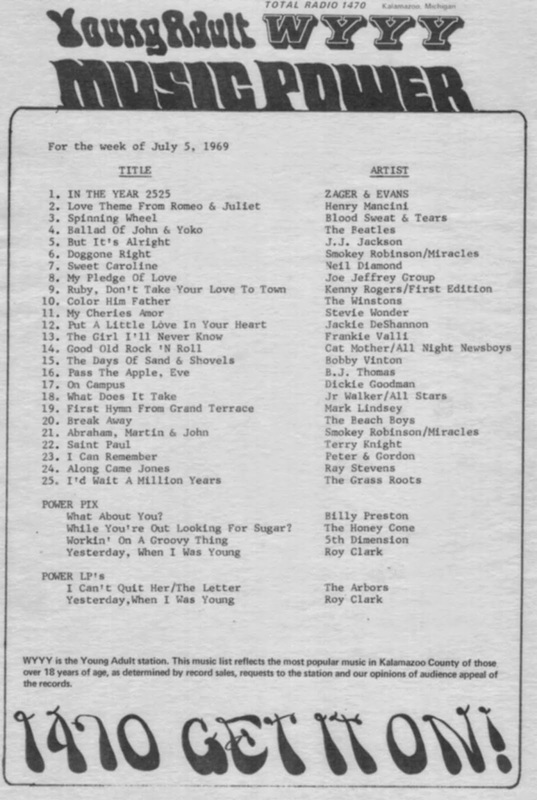 Finally, take a look at this "Young Adult" chart from WYYY in Kalamazoo, Michigan, featuring The Beach Boys at #20 with one of MY favorites, "Break Away". We've even got a very early Mark Lindsay solo track, "First Hymn From Grand Terrace" at #20! And finally a couple of tune's for America's Birthday! >>>As most are aware, so many people have been a part of Jefferson Airplane, Jefferson Starship and Starship over the years -- some have retired from performing (Grace Slick), some have gone to Rock And Roll Heaven (Marty Balin) and others have gone their own ways (Mickey Thomas). Well, Marty Balin is still alive and well (thank you very much!) so I figured we'd better get THIS retraction up right away! He's not in rock n roll heaven yet. While I'm sure it's a mistake on the reviewers part, Marty Balin is still alive ... and I thought he has rejoined the Airplane. Here's his biggest solo hit ... "Hearts", a #8 Billboard Hit in 1981. A soul giant who made Los Angeles his home was a man about town. To the people who knew Bobby Womack, or bought his records, heard his tunes covered over a seven-decade career, or caught his stellar live performances, this left-handed guitarist, a southpaw like Los Angeles Dodger pitching legend Sandy Koufax, was a melodic and lyrical force of nature. Bobby was a soul survivor who spent plenty of time on a pain train that we thankfully didn’t have to ride along on with him. Over the last 40 years around Hollywood, at least a few times a year, I would inevitably encounter Bobby Womack at a concert, recording studio, band rehearsal room, LP preview listening events, a restaurant -- usually Thai -- and any number of record company lobbies. I’d also catch him at a dentist or post office, various supermarkets, sometimes at the midnight hour or even six in the morning, backstage or in dressing rooms of countless shows, usually headlined by English rock royalty. My very first Womack sighting was decades ago at the Hollywood Boulevard law offices of Walter E. Hurst, who represented Sam Cooke, the Valentinos (Womack’s old band), J.W. Alexander, Lou Rawls, Eddie Cochran and Jack Nitzsche, among others. Bobby Womack kept his pit bull dog in one of Hurst’s vacant spaces. Kim Fowley was a client of Hurst and was truly saddened to learn of Bobby‘s death. I remember once in 1983 at the Chan Dara Thai restaurant in Hollywood immediately after I was “put on waivers” by a girl who I thought I was deeply involved with. After I was cut from her team, I nursed two Thai iced coffees. I was definitely in the bummer tent. And in walked Bobby Womack. He had just left United Artists Records up the street on Sunset Boulevard. In 2004, I mentioned Bobby in my first book This is Rebel Music where I cited him in the text. It was a moment just after we were waiting in line at a Sam Woo’s Korean BBQ on Sepulveda Boulevard in the San Fernando Valley. He had just parked his Buick Electra 225 deuce quarter and strolled into the joint beaming. “BW” had the title theme and ending credits cue on Quentin Tarentino’s Jackie Brown with “Across 110th Street.” Bobby had just gotten paid. He happily offered to buy me a head of a pig on a spit at the take-out counter. It sure looked scary, but it tasted awfully good. However, that was the last time I ate pork. In May of 2013, I was on-screen, along with Damon Albarn of Blur and the Gorillaz, Chuck D of Public Enemy, writer Barney Hoskyns, Bill Withers, Regina Womack, actor Antonio Fargas, and the Rolling Stones’ Ronnie Wood in the BBC-TV documentary on Womack directed by James Meycock. Just last month I suggested Womack’s anthem “Across 110th Street” be played on Biggles.FM radio on The California Music Show in England, hosted by DJ Mike Grant. He was doing a segment on my Radio! book and asked me for some quintessential SoCal music to program in a guest segment. Robert Feder reported this past weekend that the WLS-FM / Eddie and JoBo deal is OFF ... personally, I couldn't be happier ... but who in their right mind walks away from half-a-million-dollars a year? ... Seriously, does ANYBODY in radio still make this kind of money these days?!?! True Oldies Channel is ceasing broadcasting. I am listening now online and the DJ on air, Robby Bridges, just signed off. Next is the Sunday night Cruisin' America. It'll be interesting to see if Scott Shannon does the show. You mentioned in Sunday's comments that this past week you were listening to the TOC in your cubicle or wherever you worked. Be interesting to see what your channel programs on Monday morning. Bet you ten to one they start out with JACK AND DIANE, what do you say? Scott Shannon is doing the show tonight. I will be listening tonight to see what he says at the end of the program. The station here in OKC that used to run the TOC dropped it months ago. They were doing a poor job of broadcasting the TOC but then again, that's another story. UPDATE: And here it is ... the link is still the same ... but now he's calling it The True Oldies Channel v2.0 ... and it's running commercial free right now ... so be sure to give it a listen! To put my two cents in on the current state of oldies radio, I feel that the reason why so-called “oldies” stations don’t play a lot of lesser known stuff is because of the large media corporations that control some of these stations. They are so wrapped in their strict playlists that play what the companies think the public might listen to in order to make money selling to advertisers that they forget to ask what people would really want to hear? The corporate people would argue “Why play something most people don’t know because the public we serve doesn’t know any of this stuff!”. But the reality is that playing the lesser known stuff makes people want to seek out these recordings (among them older record collectors such as myself and younger people for whom the lesser known stuff would be brand new to them). Not to mention , it would bring back a lot of memories to people because what could be obscure to one person can be a treasured memory to another. I can also add the corporate homogenization of oldies radio practically destroyed the character of regional oldies radio stations because of the non-playing of material that were major hits in the region and the playing of certain regional artists. Here in Pittsburgh, we were practically a major part of the “Doo-Wop” vocal group scene of the 1950’s and early 1960’s because such groups as the Del-Vikings, the Skyliners, the Tempos, and the Vogues were based around this area. And WWSW-FM here in Pittsburgh helped boost the profile of Pittsburgh oldies through playing them regularly on Sunday nights back in the day. And your native Chicago’s contributions to the worlds of Blues, R&B, Soul music, and Rock & Roll are nothing to be sneezed at either (!). But all of that got lost in the shuffle by the strict playlists of today’s “Oldies” stations. I love your blog because it gives me the chance to hear more stuff that you wouldn’t hear on the so-called “oldies stations” today. And also finding out what other regions tastes in records were during the Golden Age of AM Top Forty radio. It very much boosted my appreciation of the music of the 50’s, 60’s, and early 70’s. Mr. Kelly Izaj of Pittsburgh, PA. I have found Rewound Radio to be the most reliable and consistent in playing the music oldies fans REALLY want to hear ... I listen whenever I can ... Forgotten Hits couldn't program a radio station any better! Give it a shot and see if you don't agree: Click here: Rewound Radio: It's not how old it is... It's how GOOD it is!! I know many of your readers, like myself, are fans of Frankie Valli and were eagerly awaiting the release of the movie version of “Jersey Boys,” directed by Clint Eastwood. This past weekend I was talking to a long-time friend of Frankie’s and he revealed a couple of things that I have not heard Frankie discuss publicly. Frankie had some ideas that he wanted to see incorporated into the movie version of “Jersey Boys,” but his ideas were not welcomed by Clint. Clint had a vision of what he wanted to do with the movie (including not wanting the actors to lip synch to Frankie’s original recordings). 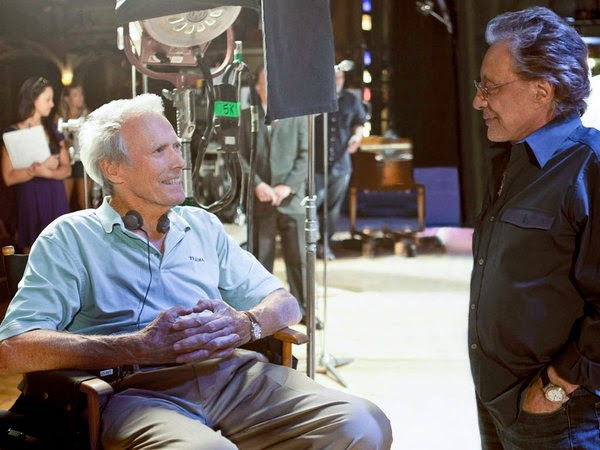 When Frankie didn’t receive any positive feedback to his suggestions, he went to the movie set multiple times and talked to Clint in-person, but Clint was firm on how he wanted to do the film. As a result, it appears Frankie’s silent protest was to skip the Hollywood premiere of the movie. He had a concert the night of the NYC premiere. As a comparison, Frankie did attend opening night of the Broadway show and has seen the play numerous times since then. Be sure to check your local listings for this one ... The Beatles' first film "A Hard Day's Night" is back in theaters all over the country in honor of the movie's 50th anniversary. (SO hard to believe!!!) I remember wanting to see this so bad when I was a kid ... but my parents didn't want to have to deal with all the crowds and screaming that was going on in the movie theaters. (Once again, this news was ALL over the papers!!!) So they waited a few weeks until all the fever had died down and then loaded up all of us kids in the back of the station wagon (in our pajamas, I might add) and took us to see it at the drive-in!!! It just wasn't quite the same, listening to it on the crappy little clip-on speaker ... but it WAS pretty cool to see the Beatle-Guys up on the big screen larger than life in the wild outdoors! Several weeks later I got the chance to go see it again in a real movie theater ... most of the screaming had died down by then (although there were some who felt obligated to scream, I guess!) I've probably seen it a hundred times since ... including a couple of months ago when I enjoyed it on DVD right here at home ... but STILL may go check it out again one last time in all of its remastered and restored glory. It sounds like Rolf Harris may have been tying down more than just kangaroos these past fifty years or so. In a case that literally spans decades, Harris was finally found guilty of TWELVE counts of indecent assault, dating back from 1968 through the early '80's!!! The Guilty verdict now brings to question Harris’ royal honors. Rolf Harris is one of the most decorated Australian entertainers ever. Queen Elizabeth II has awarded the entertainer the Member of the Order of the British Empire (MBE) (1968), Officer of the Order of the British Empire (OBE) (1977) and Commander of the Order of the British Empire (CBE) (1989). In 2012 Queen Elizabeth II upgraded Harris yet again to Officer (AO). Rolf Harris was inducted in the ARIA Hall of Fame in Australia in 2008. (With the lyrics "We Were Makin' Out In The Rain", and the matrix number 66-XY-308 in the vinyl trail-off). This was valued at $30 for a near mint copy. Oh my God ... has it REALLY been 15 years already?!?!? FH Reader sent in this Billboard article of Carlos Santana and Rob Thomas reflecting back on their HUGE #1 hit "Smooth"
Thanks for posting TRANSFUSION by the 4 Jokers. To my knowledge, that is the first time I have ever heard that version. No telling what the names of the singers are on that version. 1966 song HAPPY SUMMER DAYS. some where there about. I know the record came out in 1964 but this was some sort of survey asking for one's suggestions as to what record was the worst up to that time. We all remember those incredible bluesy vocals that David Clayton Thomas delivered as lead vocalist with Blood, Sweat and Tears, which he left 10 years ago. But did you know the new lead singer for B,S&T is former American Idol contestant Bo Bice? I’ve attached a link with details. By the way, for fans of David Clayton Thomas, he now lives in Canada and has a large jazz band. He includes many of the Blood, Sweat and Tears hits during his sets. David underwent heart surgery last Christmas and I’m happy to report he has recovered from it and has started to perform again. Food for thought ... and something I've noticed quite a few times over the years, too. How much repetition is too much repetition in a song? The worst offender that comes to my mind is Eddie Rabbit's "I Love A Rainy Night." That is not only the title but also 29 of 57 lines in the song. The one hidden line, "And I love you too," isn't enough to overcome the boredom. Yes, I know it was a hit, so maybe I'm the only one who didn't like it. The newest exercise in repetition is "My Eyes" by Blake Shelton, with the same chorus sung seven times among four short verses. "My eyes are the only thing I don't wanna take off of you" is a clever line, but I got it the first time. I didn't need to hear it seven times. And "Come a little closer" is repeated three times in the chorus; we get to hear that command 21 times. That's just lazy song writing. So how much repetition is too much? Had a great day at Cousin Brucie's 2nd Annual Palisades Park Reunion at The Meadowlands in NJ. 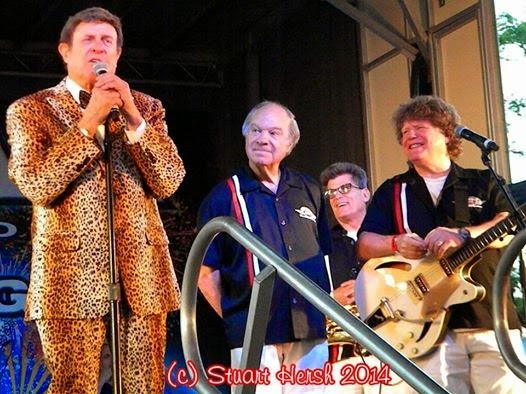 Here's a cool photo of Richie and I onstage with Cousin Brucie, wearing his classic 60's suit like he wore back in the days of the Palisades Park Shows. It was an honor to be there! Thanks to Stu Hersh for the photo. 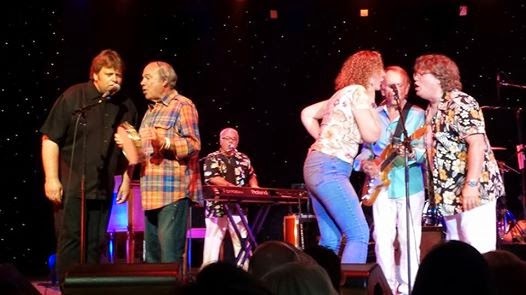 We also had the honor of singing some backup vocals onstage with Al Jardine and The Endless Summer Band (which includes Billy Hinsche, Bobby Figueroa, Ed Carter, Matt and Adam Jardine, Richie Canatta) in Atlantic City a couple of weeks ago. Al and the band are great! I've included a photo of us onstage with Al and band. Next up for us ... Streetsboro, Ohio, in a show with the great Dennis Tufano at The Streetsboro Days Festival on July 27th. Each year the town of Streetsboro has this fair called "Streetsboro Days". It runs all week. Frank Stallone and Jimy Sohns are there on Friday ... Marty Stuart is there on Saturday ... and Dennis and us will be there on Sunday. There will be a big Sonny Geraci tribute presence there though ... he is the favorite son of Streetsboro, and is well loved.